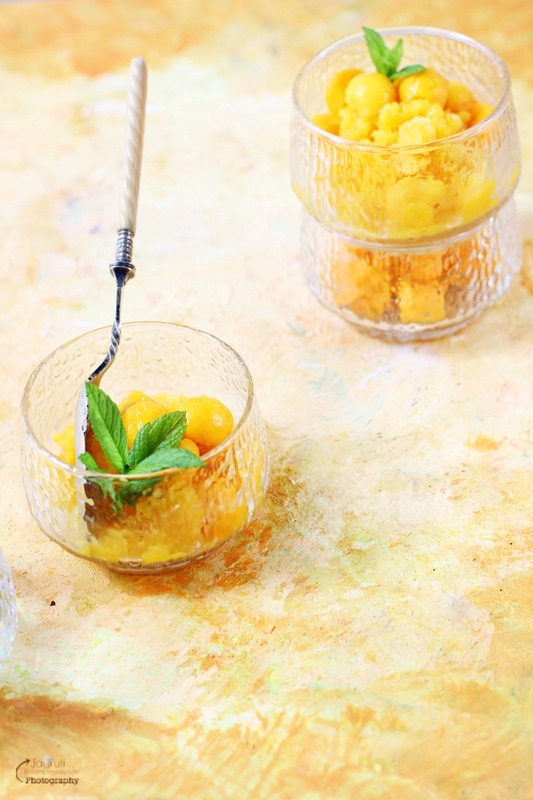 Celebrate this years tropical summer with my oh so delicious Tropical Fruit Granita with Ginger and Honey. You can definitely count on this crunchy and cool Granita if you are arranging your summer cookout or barbecue parties. Make it well ahead and have plenty of time to spare to. After just spending a few minutes on preparation and few hours in the freezer you will have a sweet, light and delicious treat for a hot summers day. This homemade dessert also works beautifully as a mid-meal intermezzo as it's not too sweet, just refreshing. 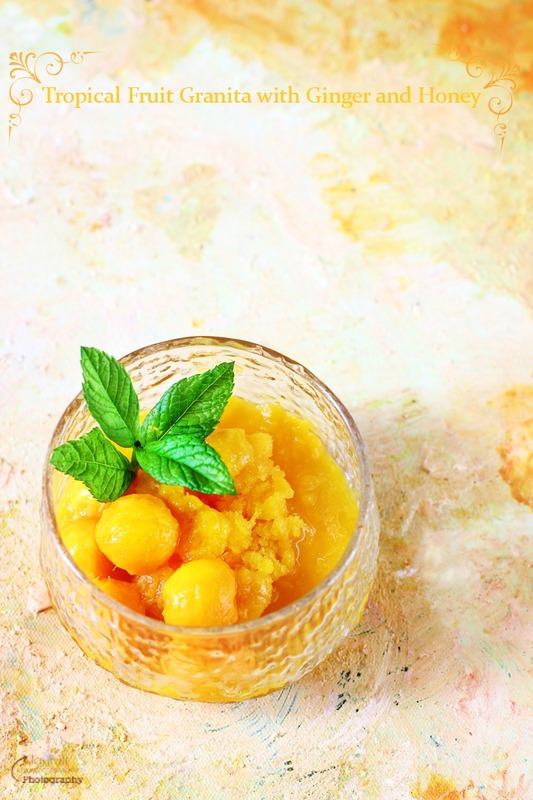 This granita is made extra easy by the use of ready made fresh fruit juice. 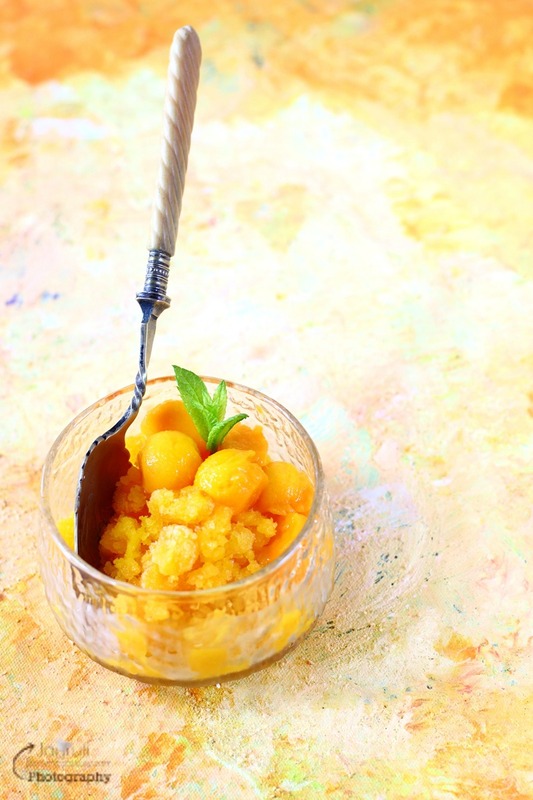 Because we are obsessed with the mangoes and ginger, I added extra mango puree and ginger juice and sweetened the dessert with honey. 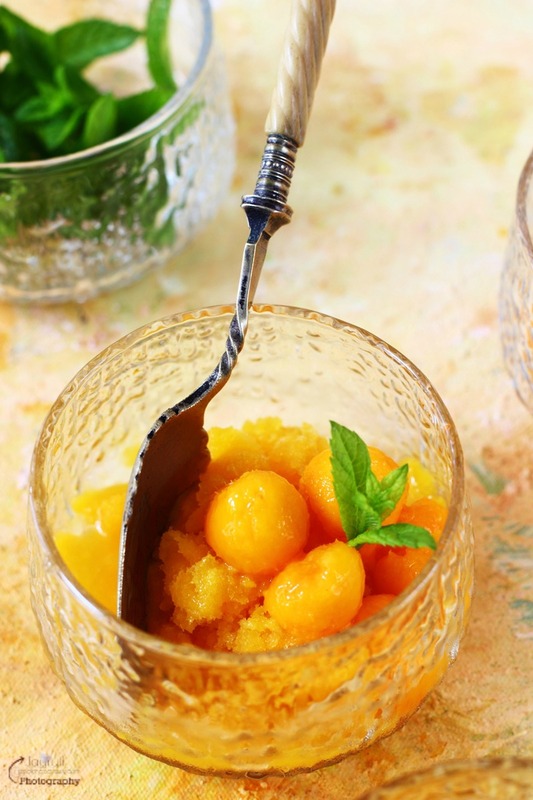 Serve it in a small serving ramekin or glass, top it up with fresh mango balls and garnish with the fresh mint, and see everyone captivated because they know that you are going to spoil them with this gorgeous frozen delight. If you are entertaining adults at your party, make this Granita a little tipsy by adding a couple of spoons of rum or champagne. Refreshing and light Granita will surely bring a smile on your face on a hot summery day ! Combine the fruit juice, coconut water, lime juice,honey, ginger juice and mango puree in a bowl. Pour into a freezer proof container and freeze for 5-6 hours. Check every hour and using fork break up the frozen crystals and return to the freezer. 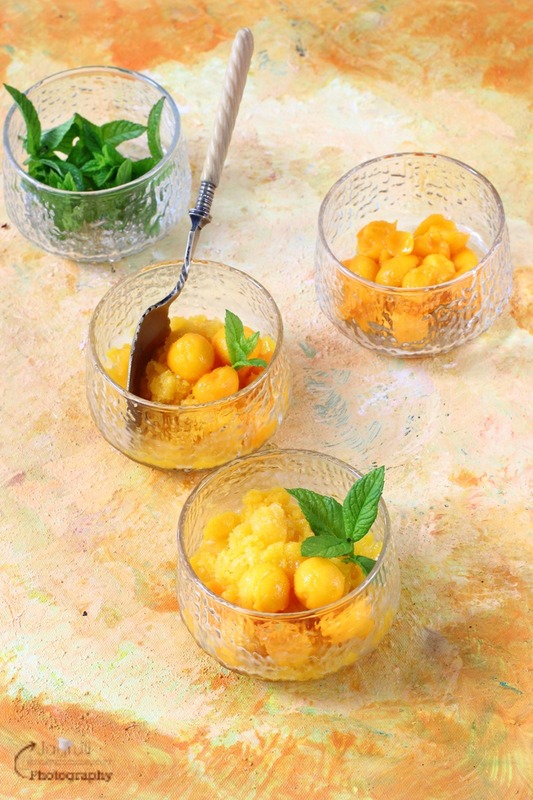 Spoon the granita into serving glasses, garnish with fresh mango cubes and mint leaves, and then serve. I love a good granita!! This looks gorgeous and the not to sweet version makes it perfect for my tastebuds! Thanks for sharing! It's been so hot and humid here in the south that I just can't catch a break. This granita sounds incredible and refreshing! Lovely clicks making the granita look so tempting. An ideal summer time treat with ginger. Omg, dont torture me like this, what an ultimate and super duper refreshing granita that too with tropical fruits. Wish i get those incredible granita rite from my lappy screen. What a colorful, cool treat to the eyes. I second Priya. May God help the people to search a new app which helps us to grab a plate from our screens. Oh my my this looks so refreshing and yummy recipe with so many nice flavours. Looks and sounds great. Mango ginger honey mint coconut all are my favourite ingredients. Loved your granita. So refreshing, colourful and delicious. Gorgeous pics of a refreshing granita. I loved the flavours you have infused into this recipe. What clicks! I really believe you should take photography lessons... just too good! The granita sounds like a lovely idea, especially with the zing of ginger... awesome! Perfect for the season we have here.. craving for all these coolers. 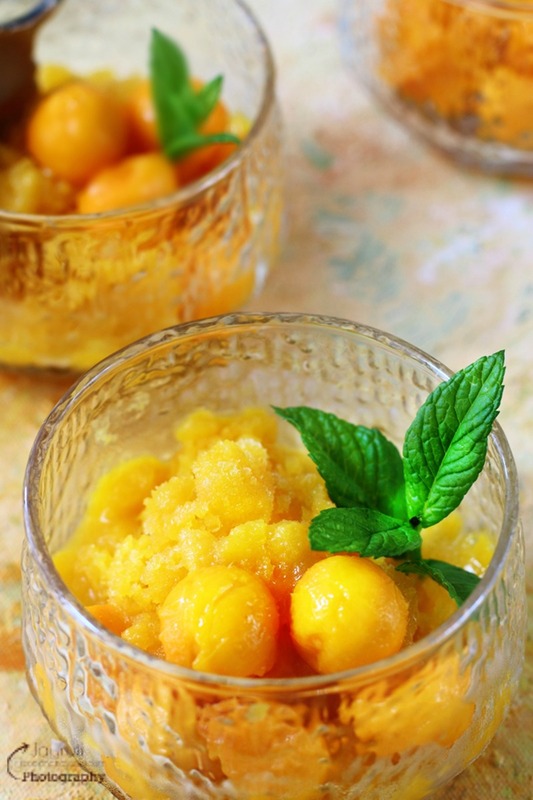 Perfect time to share this gorgeous dessert with mangoes in full season and the summer heat beating down on us! Love the cute mango balls and your background looks fab! Tropical Flavours, Ginger and honey in a Granita - you had me hooked! Stunning images and props used. With unbearable heat in my part of the world, I could eat mugs and bowls of these. I love granita, it somehow reminds me of golas in Mumbai near beaches.. haha..
Wow, such tongue tingling flavours! Love your images.. it has transported me to some imaginary tropical island! Drollin at the pictures. It really is a refreshing treat for summers. This is such a refreshing treat to beat the heat. Love granita and this looks super Jagruti. Lovely combination of ingredients. This will be perfect for summer parties. Yum! Wow the tropical fruit granita look so inviting and I am loving the contrast from the background to the pictures. Love your styling dear. I always in love with tropical flavors, And here what a colorful, cool share !! !